Since December, we've shown you a few patents related to Microsoft's Project Andromeda, which is a folding phone that turns into a tablet, and vice versa. Some believe that this is the long-awaited Surface Phone long rumored to be coming from the software giant. A new patent application from Microsoft reveals that the company might use three screens for the device, including a small display right in the hinge. 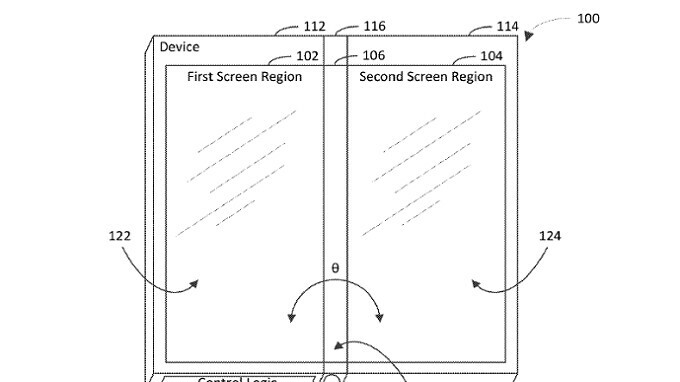 The images from this patent application show two large displays on either side of the device. In the middle, where the outer screens fold in, is a narrow display that would show information "that is coupled to other screen regions." This would include virtual controls, time, messages, notifications and calls. According to the patent application, the information found on the third screen depends on the state of the hinge. In other words, what you see on the hinge screen will depend on whether you have the device opened fully in tablet mode, "tent mode," or have the screens opened like a book. We recently told you about some rumored specs for Samsung's foldable Galaxy X phone, expected now to be unveiled next February. This device would also carry three screens, but unlike the images we see from Microsoft's patent application, the Galaxy X would have two 3.5-inch OLED panels inside the device and a similar screen found on the outside. The latter would be used to control the unit when it is in "smartphone mode." Microsoft's patent application was originally filed on November 9th, 2016 and is titled "Device having a screen region on a hinge coupled with other screen regions." The applicant is Microsoft Technology Licensing, LLC. You can check out some images from the patent application by clicking on the slideshow below. I'm fed up with those ''patents'' BSs. Only OEMs who really have tech innovations should be reworded with patents. those are just design patents, they have nothing to do with technology behind it. And that's exactly the problem here.. Samsung already design the hinge, make the foldable screen, and soon finally make the actual phone, only to get sued by microsoft? And it's not just about microsoft, lots of patent trolls also did this, they patent something they don't know how to make (and never actually trying to make), and wait until big companies make real product that looks remotely similar, they start throwing lawsuits. FYI, Samsung didn't desgined the first multiple screened hinged smartphone. So why would MS sue Samsung? What's so special about Samsung? World peace? As long as the people bow down to Samsung? Do you realize how long Microsoft has been focusing on Andromeda and this project? That's multiple screen, not foldable screen. It will never success anyway unless they can fold glass without breaking it.